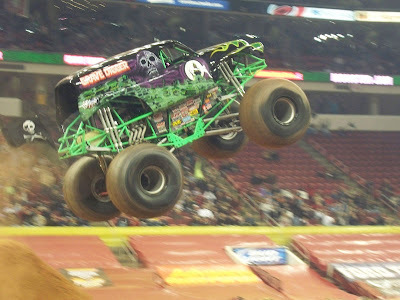 Grave Digger was a seasoned pro, well he was there at least last year, I can't remember if he was the year before. 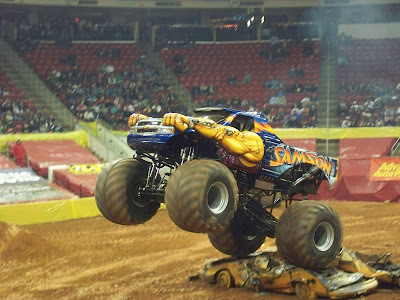 This video doesn't do the motor bikes, 4-wheelers, etc. justice, but they were awesome they did flips, they let go of their bikes 30 feet above the 30 foot hill of dirt. It was AWESOME. Of course we sat on the very front row, nothing but the best for my dad's girls:) Love him. We always have a great time together, even if the smell of the diesel was REALLY overpowering this time. There was even a really really hoochy looking girl giving out the trophies and dancing (new this year) to make sure all the people who weren't there with their kids and spouses had a good time too...maybe next year they'll trade her back for the guy who was on fire and fell from the ceiling last year, he was A LOT cooler. 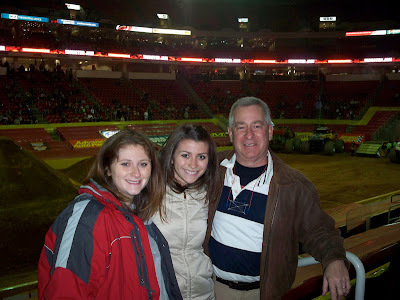 Thanks dad and Jes for another fun year at Monster Jam! PS- the following week my mom, sister, and I all went to see Mama Mia for a mother/daughter date and it was a lot of fun too! The three of us went to see the movie when it came out in theaters, so when I found out it was part of our season ticket package at the DPAC (and that Carleton would NOT go) I tried really hard to get a third ticket next to our season tickets, and I did!